Kodiak and Invictus, a TransPac 52, fly off the line in a St. David's Lighthouse Division start in the 2012 Newport Bermuda Race. *Photo by Talbot Wilson. The Bermuda Race Organizing Committee has introduced a performance screen for the 2014 Newport Bermuda Race. The purpose is to identify modern lightweight, high-performance boats with large sail plans for assignment to the Gibbs Hill Lighthouse Division, and more traditional boats for assignment to the St. David’s Lighthouse Division. The performance screen is calculated by dividing the boat’s Sail Area/Displacement Ratio by her Displacement/Length Ratio, using data from the ORR certificate that include both upwind and downwind sail areas. 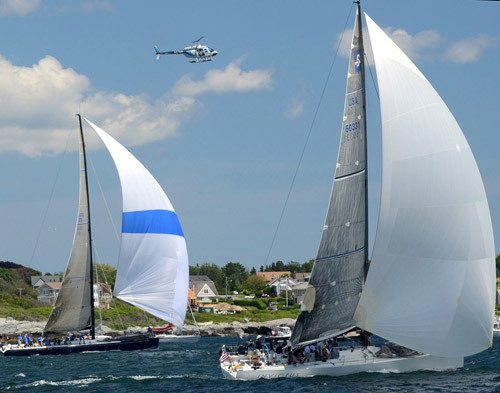 Boats from the 2012 Newport Bermuda Race fleet with low performance screens, approximately 0.10, include Swans, Cal 40s, and the McCurdy & Rhodes designs Carina and Selkie. The highest screen for the 2012 fleet, 2.33, is that of the Reichel/Pugh 90 Rambler. Under the new performance screen rule, boats with screen values over 0.72 will be assigned to the Gibbs Hill Division and those with values under 0.48 to the St. David’s Division. Boats with screens in the middle, between 0.48 and 0.72, may choose which division to enter with the proviso that those choosing St. David’s abide by the restrictions on professionals for that division. Had the performance screen been applied in 2012, five boats that sailed in the St. David’s Division would have been assigned to Gibbs Hill, including TransPac 52s, the Reichel/Pugh 65 Kodiak, and Decision, a Carkeek HP 40. In addition, five boats that sailed in Gibbs Hill would have sailed in St. David’s, including three Swans, a J120, and a J130. Three boats that fell into the middle area could opt for either division: Wazimo, Bombardino, and Snow Lion. Performance screens will be printed on 2014 ORR certificates. The performance screens for the 2012 fleet will be posted on the Newport Bermuda Race website, www.BermudaRace.com.